Alfred's new Kid's Drum Course is a fun method that teaches kids to play rhythms and songs on a variety of drums and sound sources. 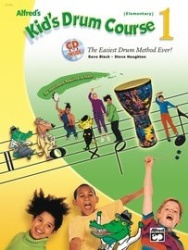 Learn from three irresistible drum experts-a clever, classical dog, one cool cat, and a friendly alligator! This book is specifically designed for use with kids at the elementary level, contains colorful illustrations to keep kids interested and entertained, and requires no prior musical experience necessary for kids or parents!